It was a weekend of close matches in the England Handball Men’s National Cup quarter finals, with Islington’s 29-25 win over West London Eagles and Warrington Wolves close-run victory against Oxford University catching the eye. The four teams that will go forward to play in the semi-finals will be London GD, Islington, NEM Hawks and Warrington Wolves. Oxford University lost a nail biter against five-times-in-a-row National Cup champions, Warrington Wolves. Oxford, 2017 semi-finalists, lost 20-19 to Wolves who credited their victory to Man of The Match goalkeeper Zsolt Deak. Wolves were ahead 11-6 at half time, but in the second half it was a rush of goals from Oxford’s Marcus Wachtmeister (five) and Frederik Poulsen (four) that saw the students claw back to within a goal. Warrington’s RafikTahroui scored eight in total as Wolves qualified for the semi-finals. Islington, who play in the National Handball League South, upset the form guide and beat Premier Handball League team West London Eagles by four goals, 29-25. By half time Islington had a narrow two-goal advantage, with Corentin Landa and Dennis Quandt scoring four goals each in the first half. In the second half Landa and Quandt again led the scoring, netting a further three times each. Despite Eagles’ best efforts, led by top scorer Romualdas Sakovicius (nine goals) and Lucas Carstens, with seven, Islington extended their half time lead to four goals by the final whistle. Islington progress to the semi-finals, and Eagles are left to focus on their Premier Handball League campaign where they currently sit seventh in the table. 2017 National Cup finalists NEM Hawks travelled to the Midlands to take on Nottingham in the second of Saturday’s quarter finals, and it was the tightest of the four weekend matches with the teams level on 16 goals apiece at half time. The teams are equal on points in the Premier Handball League table so a match this close was anticipated. Nottingham’s first half effort was led by Francisco Pereira, with seven first half goals as part of his overall tally of ten. For the Hawks, Stef Whaley scored five goals in the first half with Jamal Braithwaite taking charge in the second half, netting six times. Whaley finished with eight overall and Braithwaite with nine. But it was Carl Barnes who netted the winning goal for Hawks, to secure a 32-30 win for the Northerners. London GD and Cambridge met in the iconic Copper Box, in the Queen Elizabeth Olympic Park. 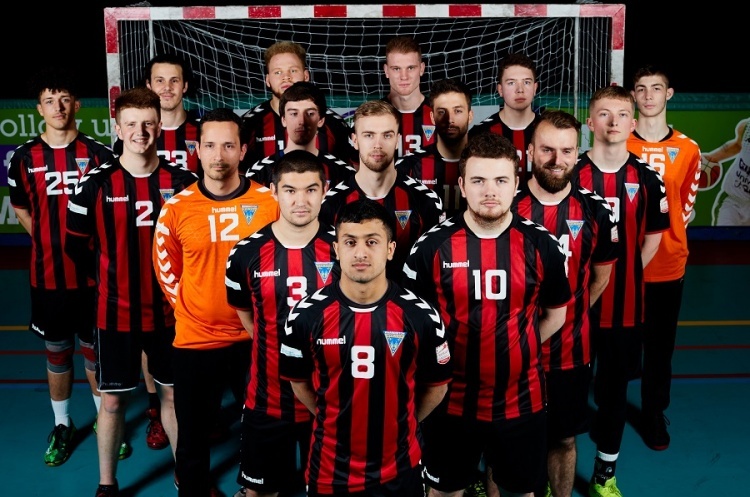 GD are sitting at the top of the Premier Handball League table, and their league form showed as they took a six-goal advantage by half time, that they defended until the final whistle. GD’s scoring was led by William Moore, with six goals, and Aurelian Gug with four. Cambridge’s scoring was spread more evenly across the team; Dario Zanghirati, Florian Stroehl, Alejandro Garcia Costa and Nico Martin all netting three times each for the East Anglians. The final score was 26-20 to GD who march on to the semi-finals. The semi-finals will be north versus south affairs, with London GD and Islington travelling north to play Warrington and Hawks respectively. These matches will be staged during the weekend of 17/18 March, and will put two teams in the National Cup final in May.